Cardinal James F. McIntyre founded Mary Immaculate Parish in April of 1954. He named Father Joseph Billman, OMI, as the first pastor. Two years later on Easter Sunday, 1956 ground was broken for Mary Immaculate School, which would serve the growing number of young families in the Pacoima area. In September of 1957, classes begun in grades 1-5. The enrollment continued to rise and there was a need to expand. A building committee was formed and volunteers were recruited from the 27 craft and trade unions that donated their time and talent on Saturdays to renovate the rectory and added it to the school facility. By the 1960’s the population boom in the San Fernando Valley began to subside. In 1969 the school phased out the double classes. Gradually the space provided by the empty classrooms was utilized for other purposes. May Immaculate School was initially staffed by the Sisters of Mercy from Manchester, New Hampshire with Sister Mary Colman as principal. In 1973 this religious community withdrew. From 1973 – 1977 the school had a lay principal, Ms. Margaret Hass. In September 1977 the Sisters of the Holy Names of Jesus and Mary accepted the administration of the school. Sister Marie Kronheimer, SNJM and Sister Virginia Stuart, SNJM served as co-principals until June 1998. Since then the school has been administered by lay principals. Currently, the school is under the administration of our Pastor, Rev. Abel Loera and our Principal, Mrs. Federina Gullano. 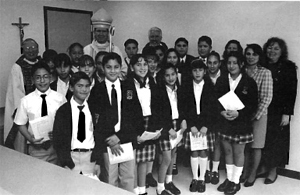 Mary Immaculate School and Parish suffered severe damages as the result of the Northridge earthquake in January of 1994. Through the generosity and hospitality of Saint Ferdinand’s School community in San Fernando, the children were able to resume their classes during the rebuilding process. In September of 1994 modules had been moved onto the Mary Immaculate campus so that the children were able to continue school at their site. In 1998 the construction of the newly re-built school was completed and housed the students for the remainder of the year. In 1996 the school Pre-Kindergarten Program was added.